As one of the commonly used communication apps, WhatsApp is popular among young users. Once you upgrade your phone to iPhone X/8/8 Plus, you may also hope to use WhatsApp on your new device as well. Then how can you sync these WhatsApp messages from old iPhone to new iPhone? In this article, we will introduce you some methods to do it easily. Keep on reading to find the most suitable one for you. 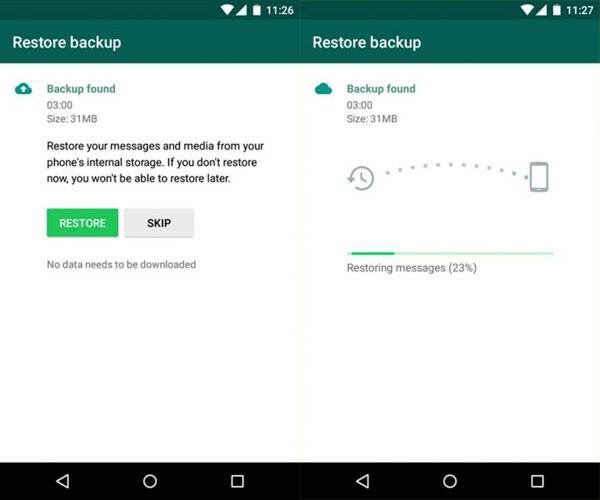 WhatsApp has a Chat Backup feature in app which allows users to backup their conversations. Then, you could use this feature to do the transfer between iPhone. 1.Enable iCloud backup function on your iPhones. 2.Go to WhatsApp on your old iPhone and click Settings> Chat settings> Chat backup. 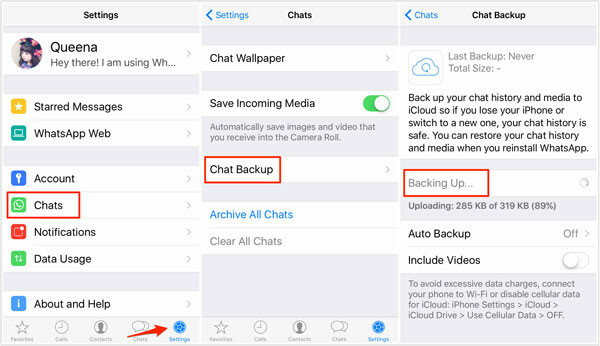 3.Tap on Back Up Now and then all the chat histories will be saved to WhatsApp's iCloud server. 4.Then you can go to download and install WhatsApp on your new iPhone and then login with your phone number. 5.It will ask you to restore your previous messages. Just click on OK to move them to your new phone. 1.Make sure your iPhone is WiFi connected. 2.Go to Settings > iCloud and then choose the option of "Backup" or "Storage and Backup" (depending upon the version of iOS). 3.Tap on iCloud backup and turn it on. 4.Click on Back Up Now. All your files will be backed up to a folder. Please wait patiently for the process. 5.Check the backup folder by going to Settings > iCloud > Storage > manage Storage. You'll see the backup folder created with the date and size. 6.Now turn on your new iPhone and choose the iCloud backup you have created to restore. 7.Open WhatsApp on your new iPhone and all your conversations will be available in the target iPhone. 1.Run iTunes on your computer and connect the old iPhone to it. 2.You will see the icon of your device at the top menu in iTunes. Just tap on it and then click Backups> Back Up Now. Just wait till the backup process finishes. 3.Connect your new iPhone to iTunes to set it up. Then choose the option- Restore from iTunes Backup. 4.After that, the target iPhone will be backed up with data from the old device and you can view all the old WhatsApp chats. 5.Now login WhatsApp with your phone number and you will be asked whether to restore the previous chats. Just hit OK to transfer them to the new device.